The Thule strollers caught our eye last year. Unfortunately, it was right at the end of the day when we needed to leave. However, this year, they were the first stand we got to upon arrival, and we got a better look at them. There are two strollers – the fixed wheel Thule Glide, and the swivel wheel Urban Glide. The Thule Glide is being used to break records all around the world for running marathons and half marathons with a pushchair. It is a serious piece of kit. The Thule Urban Glide swivel wheel can have its front wheel locked for jogging, but is also easier to manoeuvre about town. There is also now a double version – the Urban Glide 2. This looks an awesome double pushchair with a one handed fold, and one we would love to try. However meanwhile tried Master BB in the large seat (he is 5 and a half; 107.5cms tall) and we felt he fitted fine. Thus we have ordered a Thule Urban Glide and hope to review it here on Best Buggy over the summer. There is a new carrycot, which makes these pushchairs now suitable from birth. 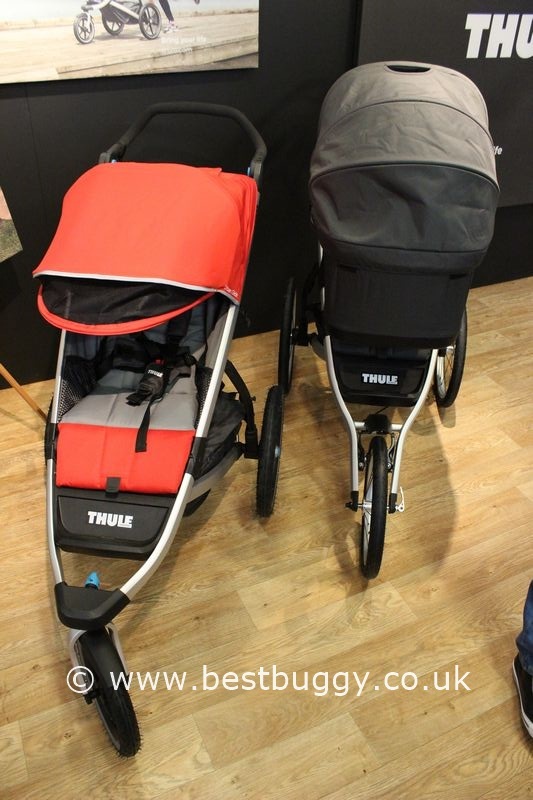 It is important to note that the advice is not to run with a baby under 6 months old but this would maybe make a Thule an option for a parent who likes running but doesn’t want to buy a separate pushchair for the first 6 months as well. We also had a quick look at the bike trailers and seats. These are multi purpose for walking, jogging, cycling, hiking or even for adding ski’s to for the slopes! We used to have a bike trailer, but these are so much simpler to convert from one mode to the other, and they include the bike kit. There is a single and a 2 seat version most of the Chariot bike trailers. We liked how the handle extended at the side to make it easy to run at the side of the trailer rather than behind. Very clever! There are several bike trailers to choose from – the Cheetah, Captain, Cougar, Chinook and Chariot – all with different features and wheels. The Thule Charity Chinook has an accessory bar onto which an infant carrier can be added too. These are really impressive bike trailers and well worth considering.